Too often, brokers and managers tend to think of top producers and team leaders as self-sufficient and self-starters, which—let’s face it—they are, since they are so successful. However, adding value to help agents contemplating starting a team is a service that brokers should be providing, and, unfortunately, too many aren’t, which can lead to retention issues. Part of your value as a manager or broker is to help your agents determine if they want a team and what type of model, or if they just need administrative help. Not assisting them in this process puts the agent out on an island on which they may find another broker interested in helping them with their team goals—or they can also set them up incorrectly, causing a lot of wasted time and money. You can be a partner in their success in starting or growing a team by helping them determine what is most important to them—then they can have a clear road map to launching a team or not. Help them determine the type of team model they are trying to set up. Do they want to set up a team where they are the primary rainmaker and add buyer and listing agents to the team, or are they looking to set up a team model with a 50/50 team partner arrangement-type of team, or are they looking to add an admin to their business to help leverage their time? Create a questionnaire. Help your agents by creating a list of questions that helps them identify the motivation and reason behind starting a team. Ask questions about what they are trying to accomplish in adding team members. Are they looking to refer online and offline leads? Do they have enough leads to refer? Do they have enough listings currently to support a team? Where do they see themselves one, three and five years from now with a team? Help them with a plan for how to compensate. Ultimately, if they are adding team members that sell, they need help in deciding how to pay them. While that is a decision that is completely the agent’s to make, you can help them in coming to the formula. Ask them questions about how they want to incentivize agents based on performance. Do they pay different payouts for listings versus buyers, or are they paid a slightly higher payout on agent-procured business, which would help them want to generate more business on their own that they are bringing into their team? Figure out ahead of time what expenses are the team leader’s versus the team members’. Guide them to put team member arrangements in writing. Make sure that whatever they decide to offer their team members, they have some written documentation that clearly delineates the agreed terms. Even suggest they run it past their attorney for their review. Too many agents don’t have a clearly defined exit clause, and this can cause lots of non-selling time in cases that don’t end well. Covering as many cases as possible on the front-end can save lots of time later. Help your team leaders establish ways to incentivize their team members. Offer bonuses for team members who exceed monthly listings or sales goals. This can be a flat $250-$500 bonus for each deal over the goal, or a scaling compensation that goes up to a higher percentage payout the more the team member makes throughout the year, rewarding their performance. Include their team in your sales meetings, events and office culture. 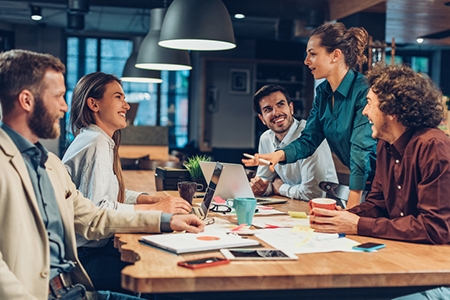 Be sure to include your teams and all their members in your weekly sales meetings, office events and trainings so they are part of your entire team. Encourage them to attend your coaching or workshops to make sure the team is using all the brokerage-supplied marketing and taking advantage of the training and coaching you are doing for the whole office.